Did you know that 18% of plumbing system failures claimed on homeowner’s insurance are caused by frozen pipes? Frozen pipes are an especially big problem in Minnesota, as winters can easily go below freezing. Don’t get caught with a burst pipe this winter! 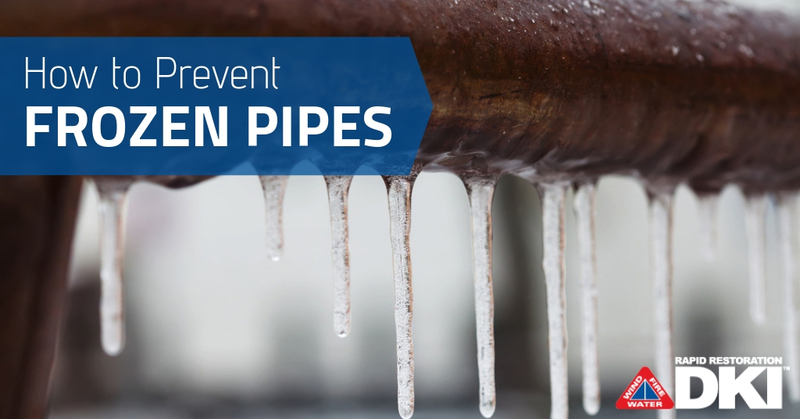 Instead, keep reading for ways to prevent frozen pipes and avoid costly water damage. Besides frozen pipes, there are a number of other issues that can arise from cold weather. If you want to make sure your home is completely ready for Minnesota’s winters, you can check out our other resources, including ways to prevent ice dams and how to keep heat in your home when it’s cold! If you need help after a winter disaster, whether it’s a flooded basement or burst frozen pipe, call the experts at Rapid Restoration! We’re happy to come by and mitigate the issue, plus fix any damage caused by water. As a full-service restoration company, we also do any necessary repairs and reconstruction to help you keep your home warm during the cold months.